BLACK MAJESTY - IN YOUR HONOUR LTD. EDIT. (DIGI) | Online Shop | Wizard LTD. Album: "IN YOUR HONOUR LTD. EDIT. (DIGI)"
You certainly don't expect classic, european sounding melodic Power Metal that reminds you a bit of HELLOWEEN when they were at their very best from a band from a country like Australia. 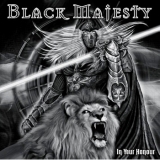 But that's exactly what BLACK MAJESTY offer us on their forth album "In Your Honour"! Of course the influence of classic Heavy Metal's greatest bands like IRON MAIDEN, JUDAS PRIEST, BLACK SABBATH and DIO, especially as far as the vocals of singer John Cavaliere are concerned, is undeniable as well. Still BLACK MAJESTY sound refreshingly different than lots of melodic Power Metal bands from Europe. Founded in 2001 in Melbourne by the two guitar players Steve Janevsky and Hanny Mohamed, the band was able to get to the top of Australia's Power Metal scene quickly by touring as support act of bands like DRAGONFORCE (by special invitation and request of the band), HELLOWEEN, SAXON, NEVERMORE and EDGUY. The BLACK MAJESTY show at the 2007 Wacken Open Air can certainly be seen as a hightlight in the career of the band as well and allowed fans in Europe to witness the live qualities of Autralia's finest. Stefan Belik of Bright Eyes Magazine stated that the band featured "unbelievable guitar work and one of the most impressive voices of the 2007 WOA festival". "In Your Honour" was produced by the amazing Roland Grapow (MASTERPLAN, Ex-HELLOWEEN) and the well fitting cover artwork was done by Dirk Illing (SCORPIONS, PARAGON, WIZARD). Catchy melodies, impressive guitar work in the best Murray/Smith - Tipton/Downing tradition and the brilliant vocals of John Cavaliere once again caraterise this forth album of BLACK MAJESTY and it follows consistently the (from album number two on chosen) path away from rather progressive Metal in direction of impulsive, melodic Power Metal. Those who want HELLOWEEN in the "Keeper of the Seven Keys" style back will just love "In Your Honour"!